— Space shuttle Atlantis is presented "in flight" inside its new $100 million display at NASA's Kennedy Space Center Visitor Complex in Florida. Atlantis' exhibit is set to open June 29, 2013. CAPE CANAVERAL, Fla. — Space Shuttle Atlantis is "go" for launch. The retired NASA orbiter and the new $100 million exhibit that bears its name is on schedule to open to the public on June 29 at the Kennedy Space Center Visitor Complex in Florida. "Everything is go," said Tim Macy, the director of project development and construction for Delaware North Parks & Resorts, which operates the complex for NASA. "We are looking forward to having a big turnout that Saturday." "I cannot tell you the level of excitement and nervousness and all the energy that goes into this just as we get down to close under three weeks to Atlantis' [exhibit] opening," Moore said. "This is really the largest thing we've done." "We think that visitation will definitely [see] a double digit increase," Moore added. 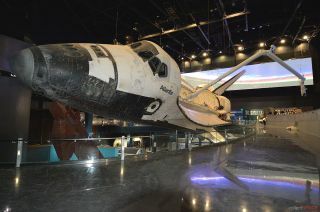 Atlantis, which in July 2011 flew NASA's final flight of the shuttle program, now has a new mission as an educational museum display. Like its sister orbiters, it will be used to educate the public about the 30-year history of the shuttle fleet and, as NASA hopes, help inspire a new generation of space explorers. Unlike the other shuttles — Discovery at the Smithsonian in Virginia and Endeavour at the California Science Center in Los Angeles, as well as the prototype orbiter Enterprise at the Intrepid Sea, Air and Space Museum in New York City — Atlantis is being displayed in "flight." "Atlantis is a very different type of attraction," said Moore. "There are only three space-flown shuttles in the world. This will be the only one in the world that will be off the ground and in flight presentation." After it arrived at the visitor complex in November 2012, Atlantis was mounted 30 feet (9 meters) into the air and then angled 43.21 degrees to one side. It then spent about five months shrink wrapped in 16,000 square feet (1,486 square meters) of white plastic to shield it from dust and dirt as its exhibition building was completed around it. In April, Atlantis was unwrapped so that its payload bay could be opened, a process that required careful execution as its two 60-foot long (18-meter) doors were designed to operate only in the microgravity environment of space. On Earth, they required metal support braces and guy wires. "It [went] as smooth as buttah," Macy exclaimed. "It was fantastic. We were very cautious but our plan worked as it was supposed to work. Everybody was a little nervous but it worked." "We have opened the payload bay doors, extended the K-Band antenna and installed the Canadarm [robotic arm], so she's pretty much in show position," he added. With Atlantis ready, Macy and his team are now focusing on completing the rest of the exhibition, including installing the 60 related exhibits that will tell the story of the orbiter, the International Space Station (ISS) and how astronauts worked outside the shuttle during spacewalks. Interactive simulators and displays are being moved into place. A full-size Hubble Space Telescope now spans the building's two floors and Atlantis' wall-length digital screen backdrop has been loaded with a high-definition movie that will help give the shuttle the appearance of being back in space. Outside the five-story facility, workers are assembling the towering gateway that will welcome visitors to Atlantis. "We're finishing up the [external tank] ET and [solid rocket boosters] SRBs stack out front," Macy said. Standing 184 feet (56 meters) tall, the full size replicas of Atlantis' launch components are partially in place. As of Friday (June 7), the bases for the two twin boosters still needed to be installed and the framework for the fuel tank was still being covered with orange panels. "From the start of the construction in January 2012 to right now, it has been quite a project," Macy said. "It has been one of the largest projects we have taken on here at the Kennedy Space Center Visitor Complex." "We are in really good shape in terms of how close we are to our opening on the 29th of June," he said. "Construction is on time and on budget, and we feel really good about it." Click through to collectSPACE.com for a gallery of photos showing space shuttle Atlantis in its final display position. See shuttles.collectspace.com for continuing coverage of the delivery and display of NASA's retired space shuttles.